When Kumud got vomiting sensation, it was only our super smart Saras whose mind did not wander to the pregnancy area. Meanwhile all the family members thought alike and came to a conclusion that she might be pregnant. They started making sweets, taking much care of Kumud, surprising her with gifts and balloons. They even did shopping for them. Everyone was very happy deciding baby names and what will the baby call them. So many expectations….. all turned futile. When Danny shows Saras and Kumud the tshirt with tag Soon to be Dad and the strap with tag Soon to be mommy, Kumud and Saras were stunned knowing what did they think about Kumud’s weakness. Saras clarified them that he is not going to become a Papa. Kumud tells them about food poisoning and that’s why such vomiting and dizziness. Soon, the happiness vanished and everyone became upset. 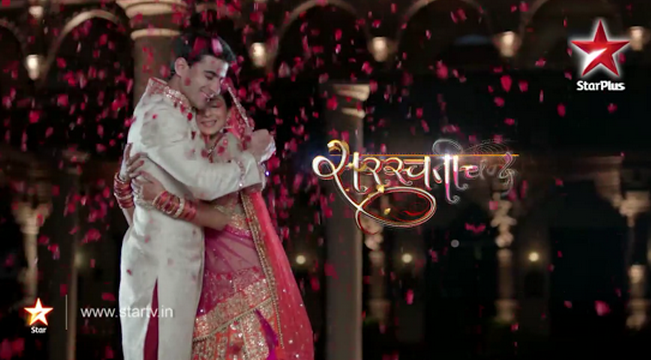 But for Saras Kumud fans, this track brought some freshness, and even they expected a good news from the couple. Don’t be disheartened, the good news is you will get to see their romantic moments once the show changes track to Mumbai. So, for now, this funny track of the show lightened us after the heavy dose of tension in last few episodes. Meanwhile, Saras is trying his lady love to agree to leave her roots and follow up with him to Mumbai. To see in which heroic way, our hero convinces the heroine, watch the show!! Poor Danny.. He had many dreams abt d kid..
Really njoyed Saras n Kumuds confused state n oders preparation for new member.. Eagerly waiting for Romantic Samud Scenes n Mumbai. In London we didnt get romantic scenes due to tat plot..